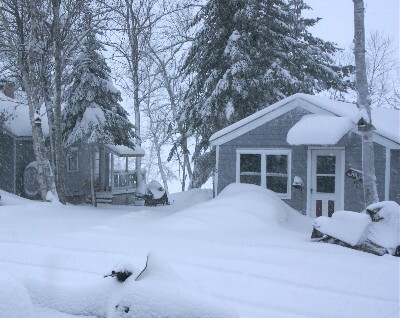 The SNOW HAS ARRIVED in Jackman and this should last well through March. DO NOT put your sleds away yet. 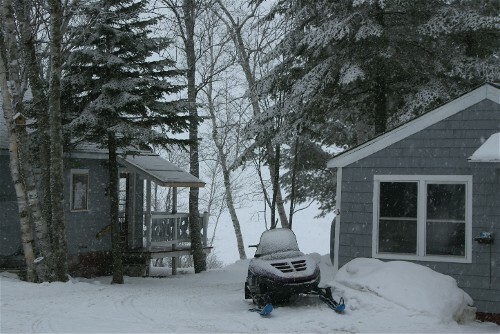 Take advantage of great snowmobiling fun this month AND OUR March Madness Midweek Blog Discount 🙂 Reserve a cabin (#6 or #2) for 3 nights, Sunday through Wednesday, and we will take 50% off 😯 the 3rd night. 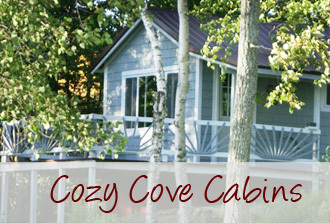 Same stipulations as our other discounts apply: payment by check or cash, cabin minimum must be met, you must mention you saw this on our blog when you make the reservation to receive this discount. This mornings image after another storm. Can you imagine how much snow is out on the trails ❓ The groomers are definitely working overtime now. More snow due in on Sunday night! 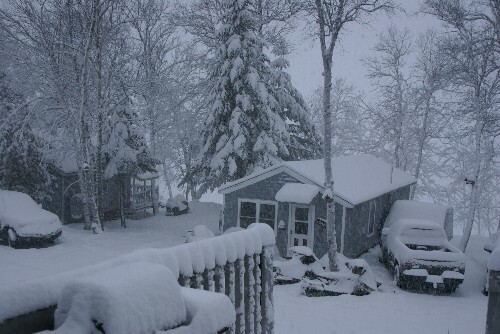 This is what it was like this morning. An easy 6-7 inches but since it was so heavy, there could have been more that actually fell. 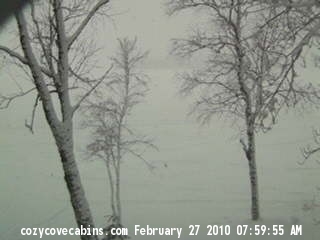 Snowmobilers are in heaven. I am not sure if you can see the actual snow but it is starting to really come down now 🙂 It has been snowing actually all day but only a little accumulation as it was about 34 degrees out. The temperature is dropping now. Trailer-ed from The Gateway in Bingham to 15 mile stream to find snow. Sledded to Bulldog Camp to attend the summit rider winter fest. Great day. Chicken barBQ, the works. Did 74 mph on radar run! Great trails good snow cover and scenery. Big Wood is still providing hours and days of Ice Fishing fun. Rich and his son Corey were here for the week on their annual ice fishing trip. They did great almost every day. Rich said they caught a lot of salmon but many were just a tad too small. It was great to see them again. 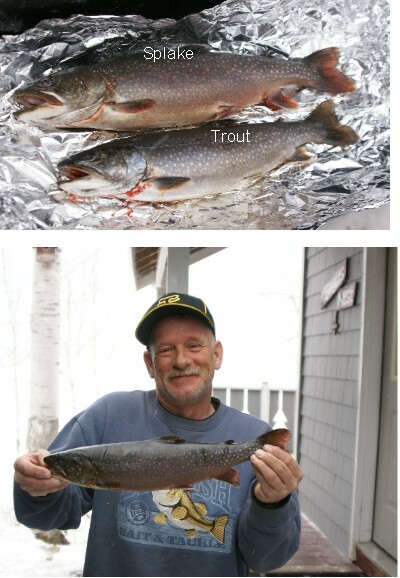 Below is Rich and his catch from yesterday. Those who ride here often know that the Bald Mountain area used to be a great trail but due to logging last year, these trails were moved. In an effort to make the best riding options for you, The trail master and groomers have looked into alternate routes: one being the Old Bald Mountain Trail. Steve went out with one of the “best” groomers in town yesterday to see how much snow there was and found gold. The area will be worked on and ready to ride on the 20th. Below is an updated version of the 2010 trail map which includes this trail and another re-route that will takes you around Parlin to Hardscrabble Road. Below this map are the most recent trail reports. Decent condition with some rough areas. There is about a 5 mile section that is on logging road- we have re-routed a section of trail to go around the logging roads which is signed. Another note, we have established a new section of trail which will take you to the Hardscrabble Road, it is referred to as the old Red Buck trail the snow is substantial, it is well marked and has been groomed. Reports are that there is still plenty of snow and in good condition. A group has gone and opened what we call the old Bald Mountain trail which goes to Fish Pond then out to ITS 89, Plenty of snow and should be a GREAT trail. If you see any trail workers in town, be sure to offer them a pat on they back. They have done an incredible job this year. OR just donate to the club. That being said, our guests are reporting that considering, trail conditions are still decent north of town. The 40 mile loop, Route 66 and on to Pittston Farm are still good riding. In town are rough but the lake trail gets you onto the trails with little dry spots. Since snow dancing is not working, maybe we need to try singing again…”Let it snow let is snow let it snow ❗ ❗ ” SEE this is working…it is starting to flurry a little now.